Ready, set … walk, run, skip, hop, jump and climb! The more kids move, the more points they earn with GeoPalz, a family-focused activity tracker. As kids earn “pedpoints,” they can trade them in for prizes such as jump ropes, baseball bats and gift cards. The prizes are free, but parents have to pay shipping and handling. In addition, parents can choose to offer their own kid-specific incentives, such as a skateboard or bike, that they plan to buy as a reward, once a child earns a certain number of GeoPalz points. The founders of GeoPalz are Rich Schmelzer, Sheri Schmelzer and Zan O'Leary, the same entrepreneurial team that created Jibbitz shoe charms (now owned by Crocs). They came up with GeoPalz as a way for families to make fitness a fun, engaging activity -- and to get their kids away from TV and computer screens. Each kid in the program gets a GeoPal, a water-resistant accelerometer that counts steps and tracks moderate/vigorous physical activity. The digital component of GeoPalz is a website where kids can log their activity, earn points, and advance along the GeoPalz World path, which shows kids what prizes they’re getting closer to earning. By tracking steps and earning points, kids find out just how rewarding exercise can be. Welcome parents, kids, and lovers of all things active! My name is Zan and on behalf of GeoPalz, we are ecstatic to be featured as today’s Grommet. Summer is here and it's a great time for kids to get outside and get active. 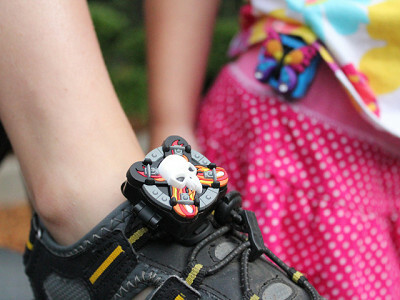 The decorative GeoPalz pedometer is a great way to get them excited about moving and start adopting that healthy habit early on! 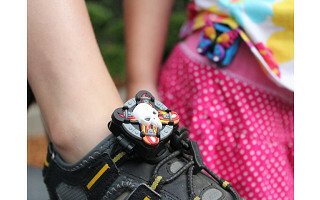 GeoPalz clips to the child’s shoe or hip to monitor activity throughout the day. Those steps are converted into points, and prizes are available to kids based on points received on the GeoPalz.com website. How active are the kids in your life? So great! I don't have any kids of my own just yet, but thinking back to my childhood, my sister and I would have LOVED this. Molly, thanks so much for your comment. These are super for fun for kids, but adults can wear them too! Actually, about 40% of our registered users ARE adults. We do have some cool designs that are a little more "adult" friendly... so check them out... and no one can resist the blinged-out Ladybug. I am getting this for my grand daughter, but want to get one for my 2 adult daughters and me too. Are there any prizes for the adults or can we help her earn points ?? Love this and the butterfly is mine! Hi Teri, we have a selection of small prizes to choose from like water bottles, jump ropes, frisbees, but you can also customize your prize wall by adding anything from Amazon.com. For example if you wanted to add a bike, book, or game, you would drag the item to the GeoPalz prize wall and allocate the number of steps it would take to earn that item. Then, once the goal has been reached, whether it was 100 points/miles = 250,000 steps, you would purchase that item directly from Amazon, and it would deduct the points from their account. It's a great way to give them a "carrot" that they actually are excited about and willing to walk for. What a great idea for getting kids off the couch and active!! I can't wait to get involved in the website! Ready, set … walk, run, skip, hop, jump and climb! The more kids move, the more points they earn with GeoPalz, a family-focused activity tracker. As kids earn “pedpoints,” they can trade them in for prizes such as jump ropes, baseball bats and gift cards. The prizes are free, but parents have to pay shipping and handling. In addition, parents can choose to offer their own kid-specific incentives, such as a skateboard or bike, that they plan to buy as a reward, once a child earns a certain number of GeoPalz points. The founders of GeoPalz are Rich Schmelzer, Sheri Schmelzer and Zan O'Leary, the same entrepreneurial team that created Jibbitz shoe charms (now owned by Crocs). They came up with GeoPalz as a way for families to make fitness a fun, engaging activity -- and to get their kids away from TV and computer screens. Each kid in the program gets a GeoPal, a water-resistant accelerometer that counts steps and tracks moderate/vigorous physical activity. The digital component of GeoPalz is a website where kids can log their activity, earn points, and advance along the GeoPalz World path, which shows kids what prizes they’re getting closer to earning.